I think more highly of Heart X-rays now in my eighty-fourth year than I thought of Allen Ginsberg’s Howl when I heard him read it in 1956. There is both more and less than meets the eye in that statement. In 1956 I was considerably more callow than I am now. I admired Ginsberg’s prosody, which reminded me of Martha Graham’s dance, but not his intellect, which I thought operatic, nor his rhetoric, which I thought overwrought. I admire the powerful witness of Heart X-rays, its fine-tuning of prosody to the summons of content, its authenticity—all this because it recalls Howl in its hurt indignation and alarm. Marcus Colasurdo is a well-published blue-collar workingman, an activist, an advocate of the disenfranchised. G.H. Mosson is a lawyer, conservationist and fair-trade champion. They live and work in multi-cultural Baltimore, a teeming, vibrant, tragic, triumphant city that represents much of what is both right and wrong in our society. 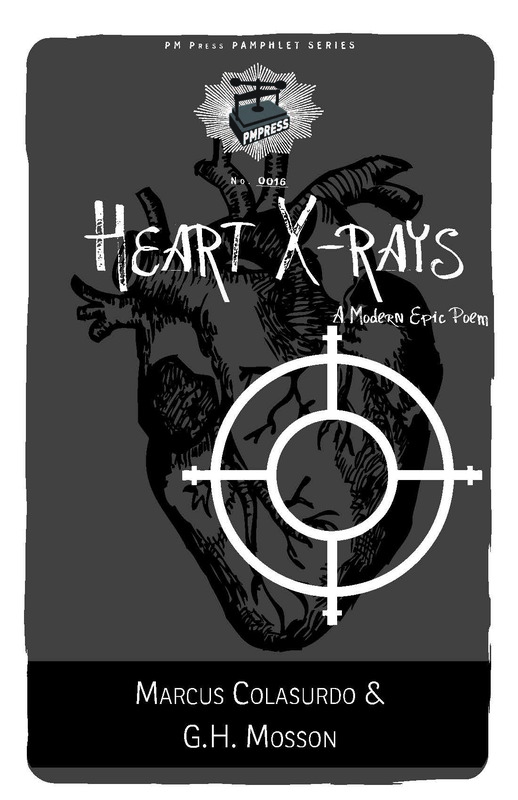 This “modern epic poem,” as they call Heart X-rays, does not have the often elegant discipline of Howl, but its cantos—that’s what we must call these titled poems if they’re to be thought of as a whole—are structurally more restless and innovative than Howl’s. Because Heart X-rays, unlike Howl, is not overtly political, it often achieves a trustworthy intimacy that Howl forfeits to make its expansive case. I can’t tell which flag you salute. Oh come, Oh come, Emmanuel…. These two down-to-earth militants are not claiming a grand vision for themselves; they’re not claiming to speak for a generation or represent a movement. They’re witnesses. Like reporters, they’re letting what they know, what they’ve seen, speak for itself. The authority of the high lonesome is present here—the authority of Nashville, which lies in witness. Ginsberg had insight and vision, but he did not have when he wrote Howl the experience that invites us to the dance here in Heart X-rays. These poems are often like the exuberant young woman who cajoles a timid young man to dance to the tunes he finds too edgy. These poems are the heart in the act of witness. Let’s call the road, time. Let’s call the journey, us. Let’s call the hints, maps. Let’s call the lesson, love. In these diverse songs is much of what makes Taylor Swift relevant, a fierce compulsion not to walk away from a recognition, a willingness to engage, to encounter, but not to lament or preach. They don’t intellectually overreach, and that’s much to be said, since many a poem is spoiled by its pretensions. into any safe deposit box. It just left town. Here’s a question the press isn’t asking. Here’s news of an alienation the press isn’t willing to confront. Here’s a way to confront it. Heart X-rays reminds us that in spite of unimpeachable evidence to the contrary the press’s regrettable smart-alecky sector is always writing poetry’s obituary precisely because poems like these address the elephants in the room—from which the press in the boorish manner of Donald Trump is moving heaven and earth to distract us. That is in fact the grandeur of Howl, its utter refusal to be distracted by dolled-up trivia, and Heart X-rays heartens us once again with poetry’s willingness to do battle with the shibboleths and dogmas of our time, and the pigeonholes and cages to which they consign us. Colasurdo and Mosson, in a demonstration of democratic commitment making no distinction as to who wrote which poem, reveal to us the cutting edge, the real news of our society as opposed to the white noise of our society which we call news in our surrender to corporate myth-making.